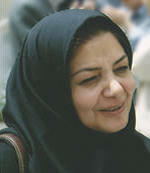 Victoria Jamali, an assistant professor in the Graduate Faculty of Environment at the University of Tehran, is a leader in Iran`s environmental law movement. Victoria co-founded Iran`s leading environmental organization, the Women`s Society Against Environmental Pollution. She traveled to Eugene to work in E-LAW`s office for 10 weeks this fall. Now, she is back in Iran and E-LAW is supporting her efforts to help Iranian citizens speak out and defend the environment. Soon she will launch her country`s first environmental law program at the University of Tehran. It`s easy to underestimate Victoria Jamali. She doesn`t call attention to herself or cause a stir when she walks into a room. She seldom wore the traditional hejab, or head covering, of Muslim women during her visit to Eugene last fall. But a veil of calm reserve seemed to envelop her, and she kept her opinions hidden behind them. Nevertheless, Jamali is helping to spearhead a quiet revolution in her home country of Iran. Along with colleagues from the University of Tehran, she is launching the country`s first environmental law program. She also co-founded one of Iran`s most active non-governmental organizations (NGOs), the Women`s Society Against Environmental Pollution. "I think Victoria is comparable to pioneers of the U.S. environmental movement, a David Brower or a John Muir," says Bern Johnson, executive director of the Environmental Law Alliance Worldwide (E-LAW), which sponsored Jamali`s visit to Eugene. "It`s unusual to see someone who goes in where no citizen environmental movement exists and starts one." In America, the popular view of Iran has focused on arms-for-hostage deals, the war with Iraq, and the Ayatollah Khomeini`s condemnation of Salman Rushdie. Few have heard about the Persian zebras, Iranian cheetahs, lung-choking air pollution, and dwindling caviar in the Caspian Sea. And few are aware of the country`s burgeoning environmental activism. But in the wake of the Islamic revolution, another revolutionary movement has emerged in Iran -- this one led by women. Making Connections Ten years ago, Jamali was approached by a 74-year-old woman, a librarian at the university named Mahlagh Mallah. Concerned about air pollution and other environmental problems, she wanted to organize a group of women to work on these issues. "The family is the smallest group of the society," Mallah was fond of saying. Thus, as caretakers of families and teachers of children, the role of women in society is very significant. Today, the group Jamali and Mallah founded has more than 2,500 members and publishes a bilingual journal, Cry of the Earth. And as Iranian society has become more open, especially over the last five years, close to 250 other environmental NGOs have sprung up and grown. Many in Iran are concerned about severe water and air pollution. Cities like Tehran must close their schools during fall air inversions, when pollution suffocates children, the sick, and elderly. Grand predators such as the Persian cheetah that dwell in the central mountainous regions are in trouble, along with other endemic species. And the Caspian Sea, a body of water bordered by several nations, including Iran, is losing the Caspian salmon, Caspian seal, and important caviar-producing fish, due to over-fishing and pollution. "The country has severe pollution problems given the primitive state of environmental regulation there," says Bob Percival, a law professor at the University of Maryland, who led a workshop on U.S. environmental law at the University of Tehran last May (along with E-LAW`s Bern Johnson). But Percival adds, "It was very heartening to see that a thriving civil society has begun to emerge in Iran, despite the immense political problems the country still faces." The lack of regulations and public knowledge about environmental matters sparked Jamali`s own interest in environmental education. While studying geography at the University of Tehran during the 1960s, she spent time on the outskirts of the city and saw firsthand how sprawl was affecting the landscape and rural communities. "I could see the effects of population expansion and development," she explains, "how they are related to each other and how they work." After earning a master`s degree in rural and regional resources planning in 1974 from the University of Aberdeen, Scotland, Jamali began working at the University of Tehran`s Institute of Environmental Studies. Though the institute had to make some changes after the Islamic Revolution in 1979, it was able to persist and even expand, especially after the more moderate Khatami Mohammad was elected president in 1997. "We kept this center alive," Jamali says. "There was a need for knowledge about the environment." Arming Activists But sometimes knowledge is not enough. Now that Iranian civic life has begun to open up, Jamali wants to give citizens the tools to protect the environment as well as to understand its problems. Now as director of environmental research at the University of Tehran, she wants to train Iran`s scholars and activists in American-style environmental law. "That`s the way we have to go," she says, "even if it causes some problems in the beginning." Jamali got the idea for the program after taking part in a conference in Washington, D.C., in 1999, attended by leaders of environmental NGOs from both Iran and the U.S. The conference was sponsored by the non-profit organization Search For Common Ground and the Woodrow Wilson International Center for Scholars. Jamali presented a paper on "Higher Education in Environmental Studies in Iran," and she got a glimpse of how environmental NGOs in the U.S., including E-LAW and Eugene`s Western Environmental Law Center, were effecting changes in policy and practice. She realized that law was an arena where activists could wield some power. Upon returning to Iran, Jamali successfully convinced male deans at her university that the program was a good idea. Then she proceeded to make it happen. She got funding from Search for Common Ground to hold the environmental law workshop with Johnson and Percival, who say they were wowed by her brains and determination. "So much of the progress of the environmental movement, both in the U.S. and elsewhere, has been the result of the courageous actions of extraordinary individuals," says Percival. "Victoria Jamali is one of these remarkable people. Her life has been enormously disrupted by revolution, war and the oppressive policies of a radical theocracy. Despite the incredible obstacles facing Iranian women who seek to promote social change, Victoria has been a tireless crusader for environmental justice. Though this has been a lonely crusade at times, she now has growing support for her efforts, which our trip was designed to help facilitate." As director of E-LAW, Johnson works with many activists around the world operating in difficult circumstances while trying to build a sustainable future. Founded in Eugene in 1989, E-LAW works to help public interest lawyers and scientists get the resources they need to protect the environment through law. Currently, the organization serves nearly 300 grassroots lawyers and scientists in 60 countries. E-LAW arranged for Jamali to visit Eugene for 10 weeks last fall to build organizational support for environmental NGOs in Iran, while auditing law classes such as "citizen enforcement" and "public lands policy." Jamali also made contacts with UO law professors who will work in informal partnership with the faculty at the University of Tehran as they develop an environmental law program. Mike Axline, one of the professors at the UO law school who met with Jamali, says that Iran seems to be following a similar path to the American environmental movement. Here, during the 1940s and `50s, agriculture and engineering colleges provided a backdrop for the development of courses examining environmental issues and policies. That produced a cadre of professionals, scientists, and advocates who helped craft environmental laws to try to solve the problems they had studied. Axline says of Jamali, "She`s incredibly brave to be doing the work that she`s doing in a country where direct citizen involvement in government is not well known." He advised her to set up an education program for judges, as well as law students, so they will understand the importance of the few environmental laws that currently do exist. Though some environmental laws are on the books in Iran, such as clean water and clean air acts, these laws are rarely enforced. For instance, in the recent planning of a highway from Tehran to the Caspian Sea, the government ignored citizens` requests to conduct an environmental impact analysis. "The government didn`t listen to the NGOs," Jamali says. "If NGOs were educated more about the rights of citizens, laws, and the environment, they would be more likely to demand protections." Hearing the Voices of Women One bright spot in Iranian environmental policy is President Khatami`s appointment of the Iranian feminist Massomeh Ebtekar as vice president for the environment. Ebtekar is now the highest-ranking female official in a Muslim country. Westerners, however, might know her best as "Mary," the English-fluent spokeswoman for the Iranian students who seized the U.S. embassy in Tehran in 1979, taking 52 Americans as hostages and holding them for 444 days. Since those radical days, Ebtekar became an immunologist, married, had children, and launched an intellectual journal on women`s issues. She briefly worked for Khatami as a journalist, and when he became president in 1997 he made her a vice president (one of the few cabinet-level positions that doesn`t require approval by parliament). Instead of cursing American foreign policy, Ebtekar today denounces pollution in Iran`s cities and the dangers facing the Caspian Sea. As head of the Department of the Environment, she also oversees registration and coordination of Iran`s environmental NGOs. According to Robin Wright, author of The Last Great Revolution: Turmoil and Transformation in Iran, Ebtekar typifies an emerging group in Iran known as "regime women," who believe gender equality can be achieved through an Islamic government. Though the political and professional role of women was stifled considerably in Iran after the Ayatollah Khomeini and other religious leaders came to power, Wright says, "Iranian women ... proved to be irrepressible.... Even the clerics, in the end, had to begin ceding ground." In 1996, 200 women ran for parliament and 14 won (outnumbering female U.S. senators at the time). In 1997, four women registered to run for the presidency, and a national poll revealed that 72 percent of the public approved of a woman as president. About a third of Iranian government employees are female. Around half of the students in Iran`s highly competitive university system are female. Iranian women work as professors, doctors, teachers, engineers. They play basketball and other sports (in female-only leagues). Even though Iranian women must wear hejab, their faces can still be seen, and increasingly their voices can be heard. Haleh Esfandiari, an Iranian scholar and consulting director of the Middle East Project at the Woodrow Wilson Center, says, "There are a large number of Iranian professional women who are achievers. They have managed to progress and advance within the restrictions of that revolutionary society." Esfandiari met Jamali when both attended the Search for Common Ground conference in Washington, D.C., in 1999. She says Jamali fits this profile. Esfandiari adds that Iran`s women-led NGOs, such as the Women`s Society Against Environmental Pollution, are extremely impressive. "They have their roots in the communities," she says. "They`re doing very practical work." Under Iran`s system of government, a lobbying group can promote their agenda if they gain support from just a few members of parliament. Their key to success is buying into the overall system, while focusing on a narrow arena of policy change. Esfandiari predicts, "As long as you have women like Victoria who are very capable and also apolitical, they will be able to function." Jamali agrees that she must remain above the political fray -- both inside Iran and internationally -- in order to achieve her goals. "We all think about protecting the environment, nature, and protecting the planet," she says. "It`s beyond politics."